Enjoy the taste of sumptuous, succulent shrimp stir-fried in a tangy Thai garlic sauce. This recipe is easy and should take just about 15 minutes to make. Salty-sweet, garlicky, and a little spicy, it's the perfect dish to serve any night of the week. It is also beautiful enough to serve at a party as an appetizer or finger food. Even your kids will go wild for it, though you may want to reduce the chili to knock down the spice. In a bowl, combine oyster sauce, soy sauce, fish sauce, brown sugar, garlic, lime juice, and chili pepper. Stir until the sugar has dissolved. Place shrimp in the marinade and stir well to coat. In a wok or frying pan, heat the oil. Once hot, add the shrimp along with the marinade. Stir-fry for 2 to 3 minutes, or until the shrimp are plump and pink. They will also be lightly browned from the sauce. Avoid overcooking or the shrimp will turn rubbery. Test the sauce for taste and adjust as needed to achieve a salty-sweet balance. Add more sugar if it's too sour. If it's too salty or sweet, add more lime juice. This shrimp stir-fry works perfectly as either a light entree for two people or an appetizer for a group. Either way, it can be plated to make a great presentation. For a dinner or lunch entree: Simply slide the shrimp onto a serving platter and sprinkle with coriander, plus an extra fresh chili (if using). Add lemon or lime wedges to the side, and serve with rice or a crusty French loaf of bread. For party service or as an appetizer: Use tongs to pick shrimp out of the pan, allowing most of the sauce to drip back into the pan. 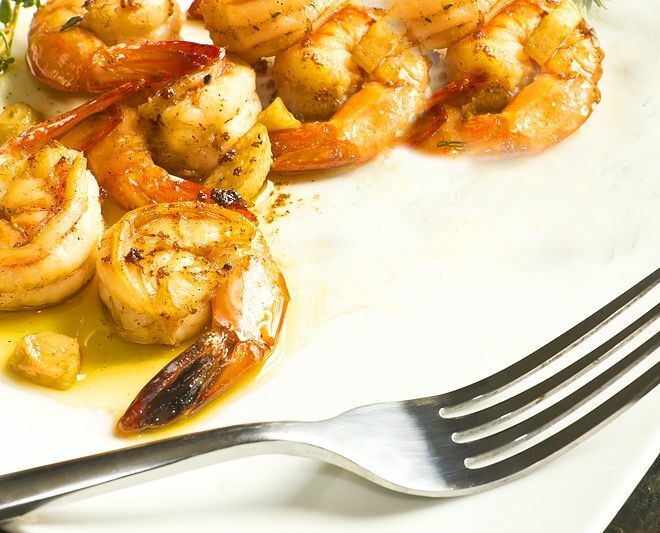 Arrange the shrimp on a serving platter with tails up and stick a toothpick into each to make eating them easier. Pour sauce over the platter and sprinkle with fresh coriander. Garnish with lime wedges.